Published on December 1, 2018 by Rachelle J. My TBR pile is down one from last week, which means I only have one book to knock off of the mountain to reach my goal of 695 books before the end of the year. Déjà Dead by Kathy Reichs – KEEP. I loved “Bones” and though I’m sure there are quite a few differences between the show and the book series, I have to try out the first book. Tuf Voyaging by George R.R. Martin- KEEP. Tuf is “…an honest space-trader who likes cats.” How could I pass that up?! 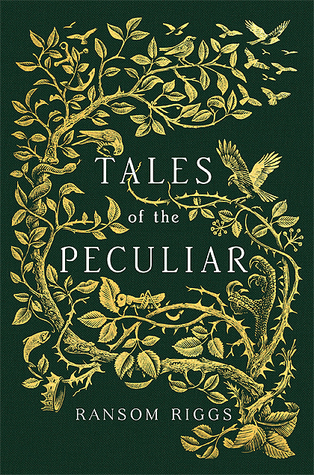 Tales of the Peculiar by Ransom Riggs – KEEP. I picked up this absolutely beautiful hardcover book soon after it was published and there is no way I’m getting rid of it. It has become a part of my permanent library. Magic Bitter, Magic Sweet by Charlie N. Holmberg – KEEP. I auto-buy anything by Holmberg, usually as a pre-order since I’m subscribed to her newsletter. The Unbroken Line of the Moon by Johanne Hildebrandt – KEEP. This is the 4th book in the “Sagan om Valhalla” series, but the 1st book in the translated “Valhalla” series. The first 3 books in the original series haven’t been translated into English, which is a bit disappointing. Since I got the ebook for free, I’m going to go ahead and give it a try. My to-read shelf is still at 696 books. I’m sticking to my goal of 695 for now. With only a month left before 2019, I highly doubt I’ll be able to get it as low as 690, but who knows? I’ve got the last 10 days of the year off from work, and I intend to spend most of that time with my nose in a book.